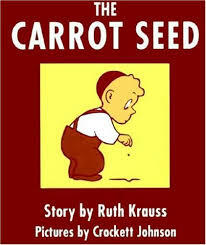 The Carrot Seed by Ruth Krauss is one of my favorite books to share with children especially at springtime. This book is a lesson in faith, hope, patience and care. The boy in the book has faith that the seeds he has planted will eventually sprout. Patiently he waits as everyone around him says that the carrot plant will not grow. He takes care of the plant by giving it warmth from the sun and water to grow, and eventually it grows!!! When we are in the middle or raising our kids, these “growing years” can seem to go on an on. If we focus on the people and world around us and what everyone else is telling us, we might begin to feel like our little sprout is just not good enough and that our care and concern just isn’t producing the right results. Here’s the good news… In the end our children WILL grow and make it through these tough stages. All your hard work, patience, faith, care, warmth, and nourishing will pay off. Your children and family won’t be perfect but they will grow and bloom from where they are now. Warmth: Give your child positive experiences, positive feedback, and hugs and laughter galore. Give them attention when they need it, and room to grow when they need space. Be a light in their life that models how to control emotions, take a break when you need it and choose kindness mixed with firmness as a means to all ends. Water: Nourish your child with a variety of experiences that match their interests and gifts. Don’t fill in every free moment with activities. Make sure you add in free time to nourish their soul. Feed them with friendships that give them what they need socially and family time that sets them up with structure, routines and traditions to last their lifetime. Weed: Focus on what is not working and weed it out of your family life… is it too much screen time and not enough active play? Then get rid of it for a while and add in more running and jumping. What are your zero tolerance behaviors that you want to dig up and pull out of your child’s life. Deal with them one at a time digging deep and really getting to the root of the problem. Weed out friends who are not supporting your parenting style and get rid of events and activities that don’t match up to your family’s values and plan. Take care of them and they will Bloom!